The Kingsley School were delighted to welcome Ms Liz Jones, Organisational Development Specialist, as guest speaker for the annual Summer Prize Giving ceremony on Tuesday 10th July 2018. Ms Jones, who has worked for over 25 years supporting people and organisations to develop in challenging environments, spoke passionately about self-belief, grace under pressure and everyday ‘superheroes’ and ‘super powers’, asking the hall of students, parents and staff to think about what their powers are and how they can be used to make a positive contribution. Ms Jones shared humorous and exciting stories from her long career, which has included working as director of a leprosy hospital at the age of 22, working for Greenpeace, Action Aid, the United Nations and the NHS. 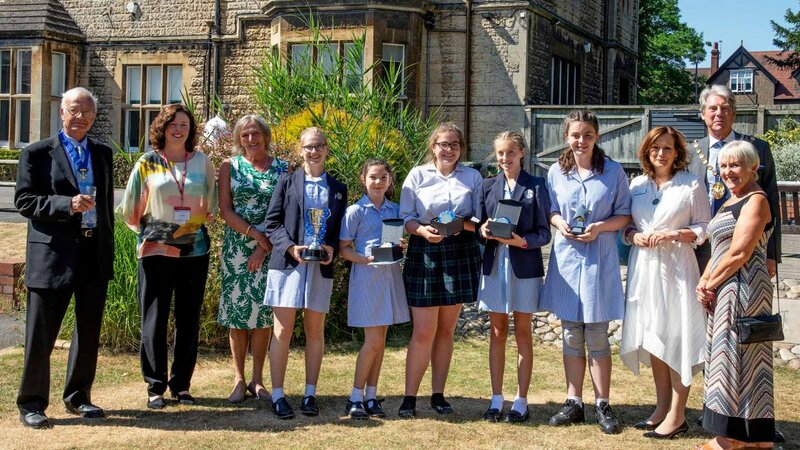 After her speech, Ms Jones presented individual awards for performance and progress and a special Kingsley Rose Award for girls who exemplify the spirit and ethos of the school in their attitude, conduct and behaviour towards staff and fellow pupils. This year’s winners are: Chloe Gardiner (Year 7, from Warwick), Abi Lawson (Year 8, from Warwick), Lucy Greaves (Year 9, from Rugby) and Beth Rickett (Year 10, from Warwick). The Prize Giving event was also attended by High Sheriff of Warwickshire, Clare Sawdon, Chair of Warwickshire District Council, Cllr Stephen Cross and his consort, and the Leamington Mayor’s consort, Mr Gerald Calver.